With 10,500 Olympic athletes and 4200 Paralympic athletes competing, an estimated 11 million visitors, 21,000 journalists and around 200,000 staff members, there will be a lot of mouths to feed at the games, which in turn, means a ton of packaging required. With the eyes of the world set on London, the London Organizing Committee of the Olympic Games and Paralympic Games (LOCOG) made a bold move. Instead of accepting the almost certainty of PET bottles filling up trash cans and Styrofoam containers littering the land, London 2012 became the first Olympic and Paralympic Games to commit to a zero-waste-to-landfill target. “While a handful of events and venues have achieved recycling performance of up to 50%, recycling rates are generally much lower (approximately 15%) and a significant amount of material either ends up in landfill or is sent for energy recovery,” LOCOG said. During the Olympic Games, the potential impact is more than 3300 tonnes of food and food related packaging waste, according to some reports. Matthew Aylott, Communications Officer for bio-based consultancy NNFCC, told PlasticsToday the organizers of the Olympics Games approached NNFCC for advice on how the Games could reduce waste from the packaging sector. One of the major stumbling blocks was that almost 40% of the total catering waste was likely to be food or packaging contaminated with food, he said. “To help tackle this problem, we worked with our UK Renewable Packaging Group and we helped set up a supply chain for compostable packaging to the Olympic Games,” Aylott said. After consulting with the NNFCC, the LOCOG implemented a rule that every scrap of food and drink packaging will be either recyclable or compostable. By using a mixture of recyclable and compostable materials, they can reduce waste and ensure that at least 70% of all waste from the Games will be re-used, recycled or composted, Aylott said. The remaining waste will be taken away and used to create electricity, which may help prevent any waste being sent to landfill. Materials getting a ‘green’ makeover include fast food wrappers, sandwich boxes and drink cartons, according to the NNFCC. The bio-based plastics used are modified cellulose, co-blended polyesters and complex starches. These materials will be compliant with EN 13432, the agreed European Standard for compostability, and as a result will be suitable for treatment by an in-vessel composter or potentially an anaerobic digester. This will allow them to be converted into a low-carbon compost and, if used in an anaerobic digester, renewable energy as well, the organization stated. 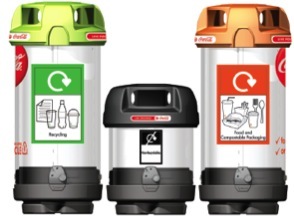 All compostable materials will be labeled with an orange recycling symbol and can be put in a corresponding orange bin, along with any food waste. Recyclable materials will have a green symbols to differentiate them from non-recyclable and compostable wastes. These materials can then be put in corresponding green bins, which will be placed around the Olympic venues. In total, there will be about 4000 containers for recycling, composting and residual waste across Olympic venues. Coca-Cola expects to serve more than 20 million bottles of Coca-Cola products during the course of the Games. The beverage giant has committed to recycle all soft drinks bottles that are disposed of at Olympic and Paralympic venues and return that waste into new bottles within six weeks. “Coca-Cola is working with LOCOG to ensure London 2012 is the most sustainable Games possible and a zero waste games,” said a Coca-Cola Enterprises (CCE) spokesperson. LOCOG’s waste partner, Sita, will sort the contents of these bins and then the bottles will be taken to Continuum Recycling where they will be processed into food-grade rPET flake. This will then be transported to one of Coca-Cola Enterprises’ six UK manufacturing sites and will be turned back into new bottles. Coca-Cola estimates 80 million new bottles will be created as a result. Every Coke bottle will be made with the company’s PlantBottle packaging technology, which is a mixture of materials, containing up to 22.5% plastic made from plant-based materials and up to 25% recycled plastic. The remainder is plastic made from petroleum sources, which is the material of its ‘regular’ plastic bottles. As a long-standing sponsor of the Olympics, McDonald’s presence is felt throughout the games from its iconic symbol on the food packaging to debuting the world’s largest fast food restaurant just 900 feet away from the Olympic stadium. The fast food giant is providing its customers with cups, cutlery, straws, lids and containers which have all been strictly certified in accordance with standard EN13432 and made of Mater-Bi, the family of biodegradable and compostable bioplastics produced by Novamont. McDonald’s will recycle and reuse all of the furniture and equipment from its Olympic sites, and nearly all of the building materials will be used for future and existing restaurants. Once the last gold medal has been handed out, Aylott said the hope is to maintain the sustainability momentum and build on the success of the Games, while recognizing where things can be improved for future events.